A couple months ago, Kyle and I took a long weekend trip to NYC. As we sat on the glowing red steps, surrounded by incredible lights, sounds and an unexplainable energy, we couldn’t help but think about the millions of people who have been here before us. 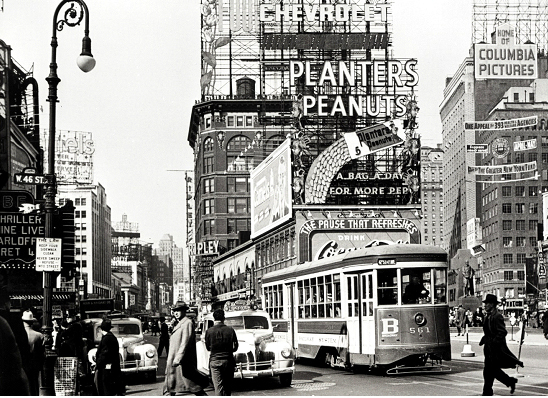 Kyle began pulling up images on his phone of Times Square throughout the years. It is amazing to see the evolution of transportation, clothing and architecture over such a relatively short period of time. But what we found ourselves paying particular attention to was the changes in advertising. We couldn’t help but analyze the ads – the type of businesses, the fonts, the scale, the themes, and the technological advancements. Even on vacation, we’re thinking about advertising! Below are some pictures we looked at that night, and our comments along the way. *Note: We are not historians by any means and cannot guarantee the dates associated with these images. Ah…my favorite era. Look at those cars! There’s no overlooking the Maxwell House Coffee and Chevrolet ads – two companies who are still going strong today. It looks like advertising works! Were the lights all really white or is it just because it’s a black and white picture? And what is Squibb’s Dental Cream? I would love to hop in a time machine and see for myself! Pictures from this time frame were harder to find. You can see the familiar logo of Coca Cola behind the streetcar. It’s amazing that one company can brand themselves so well that almost a century later, we can still clearly recognize that logo, even when 80% of it is not visible. I would love to meet the marketing team responsible for that branding! Are you eating a bag of Planter’s Peanuts everyday? According to that sign, you will have more pep if you do! I also love the ad on the right hand side of the picture that says “Buy That New Automobile Now.” Someone mastered the concept of a call to action! 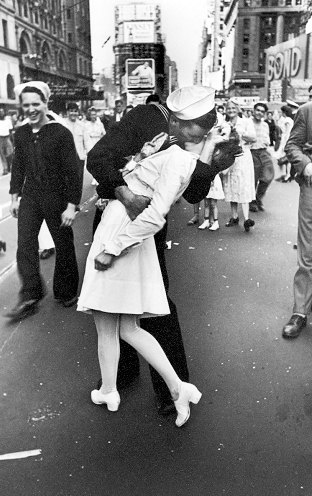 Though this image doesn’t add much in the way of company advertising, I don’t think you can have a history of Times Square segment without including the iconic 1945 kissing picture. Maybe in a way, it captures the essence of advertising – an image so unforgettable, it lives on throughout the ages. Does your advertising become burned into the minds of those who view it? Does it leave them with a feeling they don’t forget? I suppose there’s no denying the importance of cigarettes and liquor in the 60’s culture! This Kent ad does an amazing job of portraying a concept that we stress to our advertisers daily – SIMPLICITY. When you look at this picture, in a sea of chaos, your eye is immediately drawn to those big, bold letters – KENT. Also notice, 20 years later, Coca Cola is still visible in Times Square. 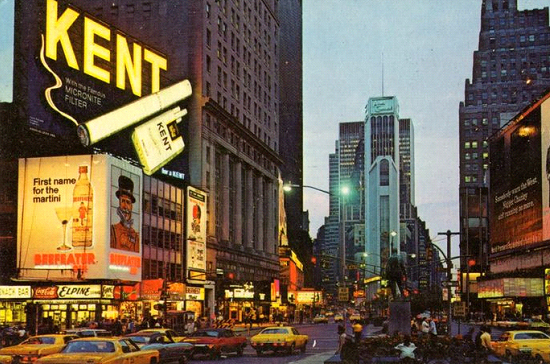 By the 1980’s it’s apparent that advertising is the most valuable use of space in Time’s Square. Every building is completely covered with large scale advertisements. It seems to me that businesses are competing to have the most unique and innovative ads. Once again, Coca Cola makes its appearance, right in the center of it all. Is that a digital ad? Oh… Coca Cola, there you are again! A QR code? 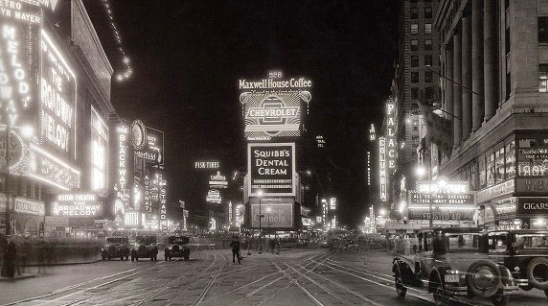 If only the people walking those streets in the 1920’s picture could see this! 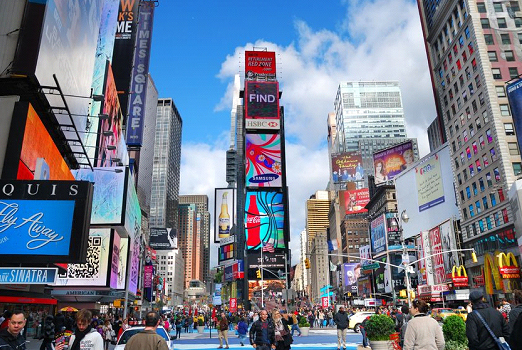 If you haven’t made the trip to NYC and visited Times Square, I highly recommend it. Pictures can’t portray the liveliness and exhilaration you feel when you round that corner and sneak your first glance of Times Square – bright as day, but in the middle of the night. Gone are the days of billboards and still ads, replaced by ever moving and changing digital images – some the size of football fields. I will never forget the time we spent, sitting on those iconic red steps, taking in the sights and truly appreciating the time, energy, effort and money that those businesses put into creating these amazing ads. The change over the past 100 years is fascinating and I can only imagine what the next 100 years will bring!